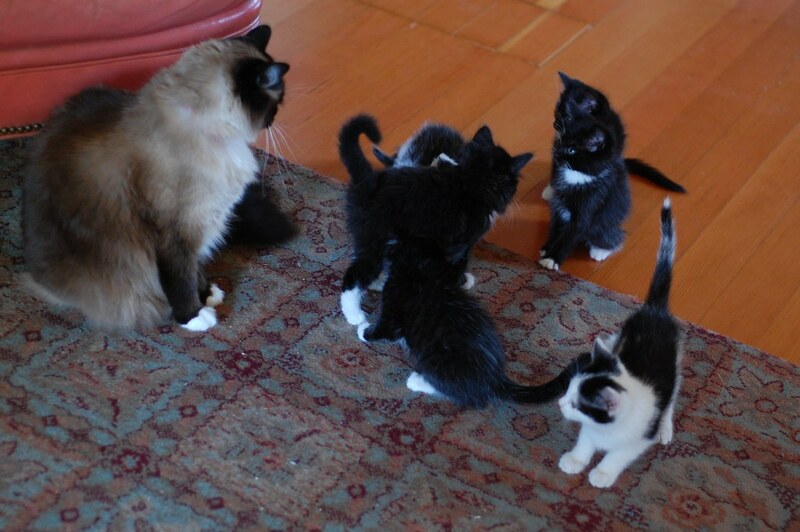 The Itty Bitty Kitty Committee: Bean Meets the Babes! The kittens were itchin' to get out and explore. As soon as I released them, they charged out of their room running full speed with their noses to the ground, taking in all the new smells in the dining and living room. After they had a little time to soak it all in, Ms Bean entered the picture. Once the kittens got a glimpse of Bean, they swarmed her with their tails straight up in excitement and rubbed their little bodies against hers. Charlene sat and soaked it all in. She tried to give them a few licks, but it was difficult with all the kittens swirling about. After a few minutes, the kittens moved on to explore more and Charlene slipped out of the room in search of a bowl of kitten crunchies. I swear in the last picture it looks like Charlene is counting the kittens. (More kittens=more kitten food) I also love the perky tails of the little ones; they are so happy to meet their foster-mom! I am really looking forward to more pictures! Laurie, you had me laughing with your description of the meeting even before I got to the pictures - which are so heart-warming. Those kittens now realize the won the kitten lottery, with you, Craig and Ms. Bean to help them grow into their forever homes! I especially like the one picture on Flickr where it looks like Bean is playing follow the leader with them!!! I don't know if words exist to describe that series of pictures...adorable just doesn't suffice. Charlene looks like she's the kitten nanny. Very sweet pictures! Awww. That is just too precious. The Bean is a special cat to be so welcoming to all the kitties that have passed thru Casa IBKC. Flickr photos ??? there are more photos? these are adorable, but more would be better! Double click on one of the pictures and it will take you to the whole set on Laurie's Flickr page. So, so, so, so much cute kitteny goodness! Awwww. that looks like so much fun! i love the description of them running to meet her with their tails held high. adorable! They look so cute swarming around her and she looks so patient with them. I think it speaks to how amazingly well you have them socialized that they all like the mysterious Bean-cat when they meet her. Your home makes me happy! Ms. Butterbean notes that Laurie didn't mention that she is interested in the kitten crunchies only because of the necessity to test the kitten food to make sure that it's of acceptable quality. Of course the more kittens, the more tasting she needs to do. It's all part of the full Butterbean experience. She especially emphasizes that only the unwashed masses would consider her faithful testing of kitten food to be greedy gobbling. AnnF - you are spot on!!!! Charlene does look so very happy in these pix. The last picture looks like Ms Bean is saying "Now, CHILDREN!!!" Gotta love those pipecleaner tails, too. Which kitten is that with the awesome multicoloured tail at the far end of the last photo? Is that a suggestion for a better airport name, The Charleen Butterbean Airport, is better than boring Seattle-Tacoma. Oh those kitten-cluster pics are adorable! I cannot stop smiling. This post, and the accompanying pics, is such an incredible upper. I, too, love the images of the kittens surrounding Aunt Bean with their tails a-tilt, tiny bodies wiggling with delight. Yay! Charlene is such a special kitty. The way she takes to all the kittens is just amazing! And even more so because she was never a mother! 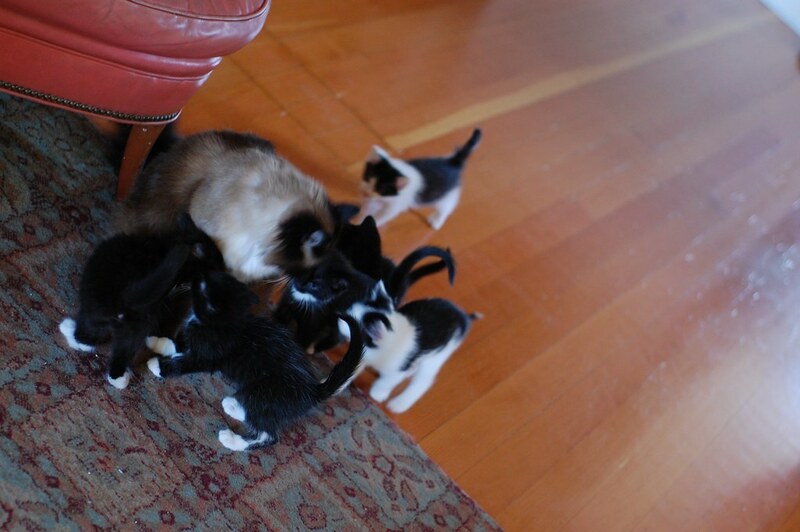 The kittens must just instinctually know that she will take care of them so they just flock to her. I would think that they would be a little afraid, but I they seem to really know! I agree, Ms. Bean is a very special kitty to be so accepting of all the kittens. 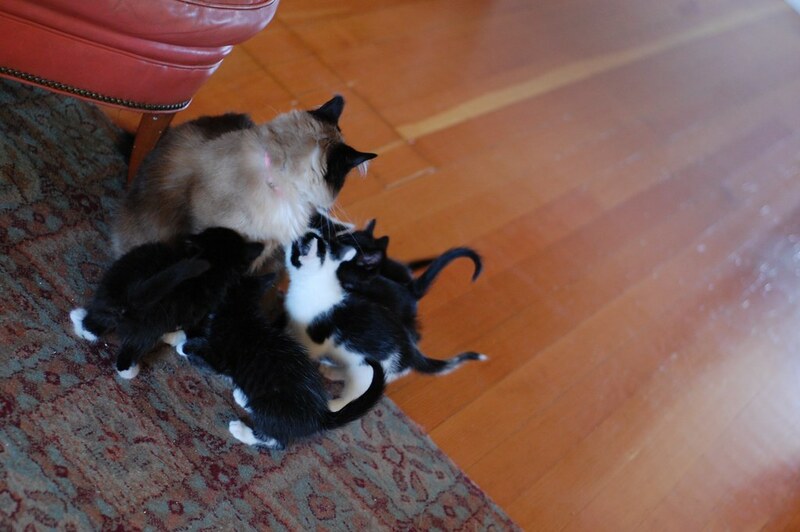 Love the pictures of the kittens swarming her. So sweet. What a treasure!